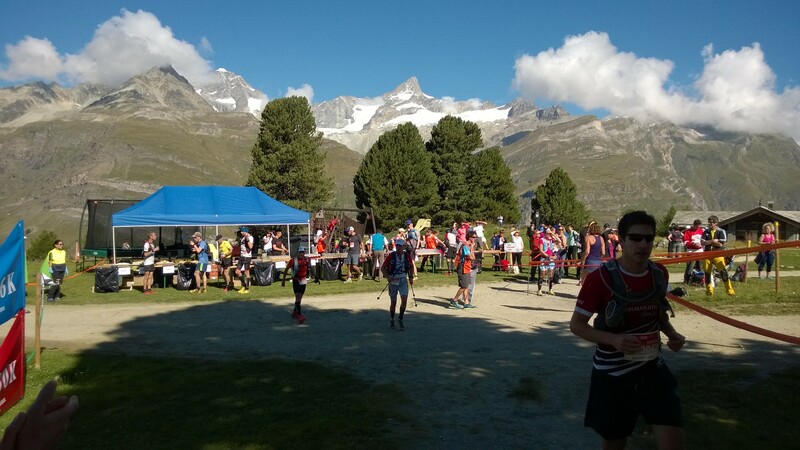 If you were to ask someone to create a race that had a fantastic route, over alpine trails, with lots of elevation and with breath-taking scenery, this is likely to be the race that they would create. I signed up to this race about November last year I think. It was one of those spur of the moment things when it popped up in my timeline on Facebook. I had no experience of this kind of running at the time, and I remember posting something on Facebook after I’d signed up along the lines of “I just signed up to this…ambitious?”. Thankfully, it wasn’t ambitious at all. We decided to make a bit of a holiday out of the trip, since flying all the way to Switzerland for a race is a little excessive to begin with. We flew into Geneva last Monday, had 24 hours in the city, then caught the incredibly clean and precise train all the way to Zermatt. Right from the start Switzerland was doing its usual thing of being smart, clean, adult and beautiful. I’ve spent a lot of time in the country with work over the years and I really do like the place. It makes itself easy to like though. We rented an apartment in the town, which as it turned out was perfectly located. Zermatt isn’t all that big any way, but it was close enough to the centre and had a great view of the Matterhorn, so it ticked all the boxes we needed. Our arrival in Zermatt was quite late in the day on Tuesday so it was a case of finding some food and settling in for the night. Wednesday morning I was out around town, working out my bearings and, importantly, buying a map. Over lunch I worked out a plan to run Wednesday and Thursday and take it easy on Friday before the race on Saturday. I knew this was cutting it fine and that my legs would be tired on the day, but I figured as long as I limited my climbing over the two days, I could get away with it. 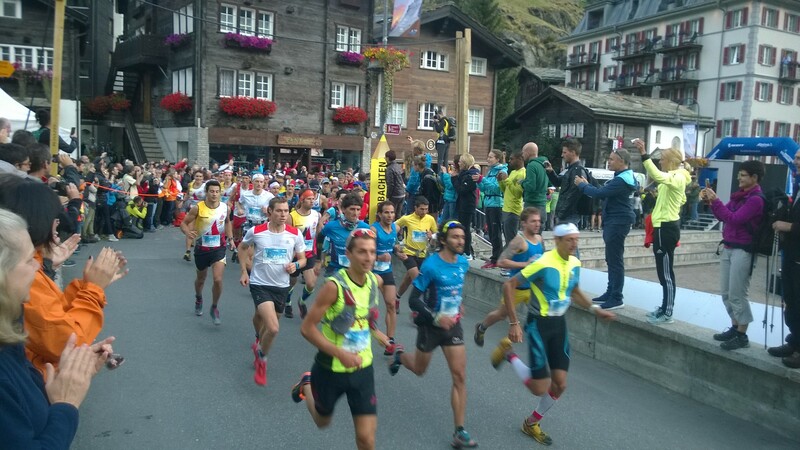 The race was a loop around the head of a valley which started and finished in Zermatt town centre. The course took in three big climbs and three descents. I wanted to try to recce as much of the race route as possible beforehand so I decided to run the first ascent on Wednesday, then follow the line of the some of the first descent before heading straight back down into Zermatt instead of breaking off towards the next climb. Then on Thursday I took one of the cable cars up to Schwarzsee, which is at the head of the final climb and then run the 10km long descent back down into Zermatt. This all worked perfectly and gave me the opportunity I needed to get the worst parts of the race clear in my head. This included the climb from Furi back up to Schwarzsee which was steep, long and, as it turned out on the day, difficult in intense sunshine! On the Friday, we took the train up to Gornergrat to take a look around from the top. The glacier was simply magnificent and really did make you realise how special the place is. Then came race day. 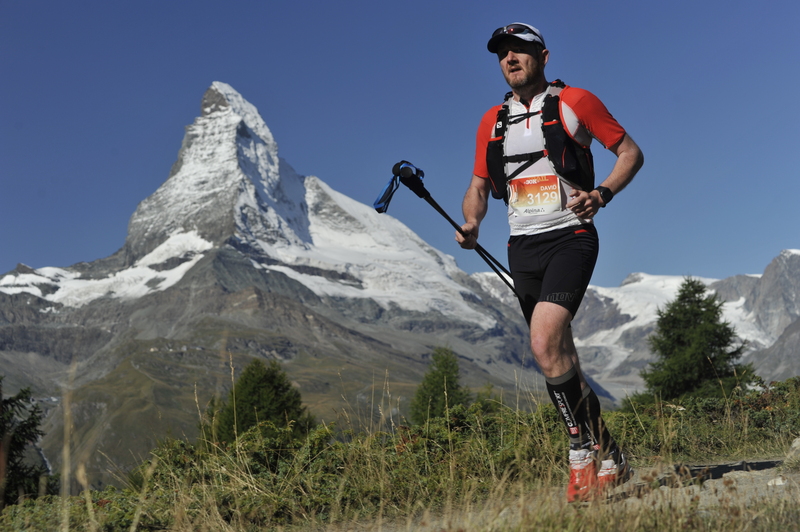 The Ultraks is more of a running festival with 6 races in total on the day. I took part in the 30km trail race, but there was also a 46km, a 16km, a vertical race (VZR), a 30km corporate relay and a kids race. The 46km race was the main event with some famous professional runners toeing the start line. they took off before my race so I got the opportunity to see the start of the 46km race. 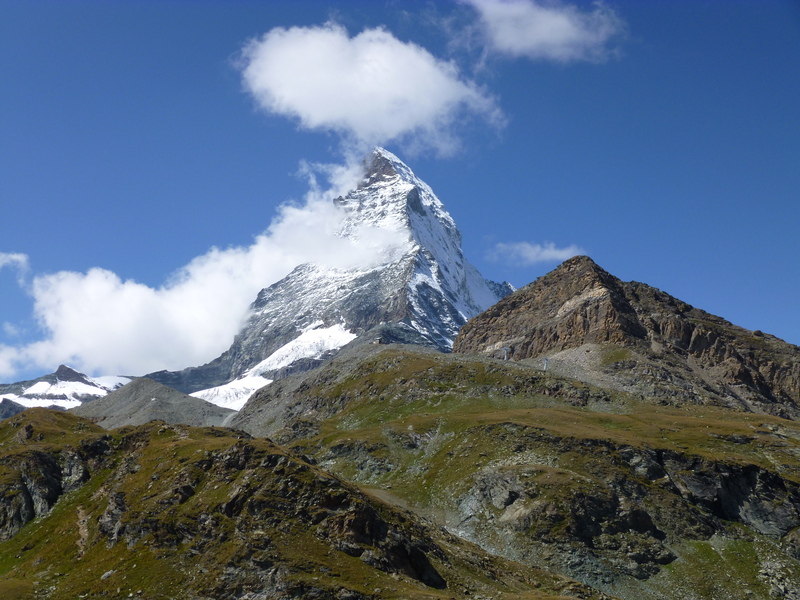 There was a real buzz around Zermatt, it is such a perfect town for this type of event. Before I knew it the 30km race was 10 minutes away from starting and I was shuffling my way into the start pen. In my recce for the start I knew that the route headed out of the town and eventually broke off up a narrow single track trail through the woods about 1km in. With close to 700 runners in the race this was always going to be a bottleneck unless you were in the first 10 people to reach it, so I knew that being towards the last 20% of runners in the pen was a bad start. After some enthusiastic encouragement from the race announcer to warm us all up, we were off. The pace from where I was started at a slow jog but the runners quickly broke up which provided some space as we ran through the streets. the crowds were out supporting and it felt great to be part of such a big event like this. The road out of town started to climb and people slowed down to their natural climbing pace. I found myself starting to pass people but I was encouraged by the fact that, despite lots of people around me sprinting to get a better place, I paced myself so I didn’t tire too easily. One of the big things I wanted to do in this race was to simply enjoy it. The scenery as I’ve said is simply amazing, and I may never come back to run it again, so I wanted to enjoy it for the experience and not ruing things by being exhausted within the first 5km. As we hit the first climb I found myself at what I estimated was about 50% of the way through the field. This felt about right as everyone around me by now was running similar bits to me and walking the bits I would walk, so it felt like I was in the right place. The first climb goes about 60% of the way up the hill, then levels out to traverse around a long flat trail. This was really narrow and over-taking was almost impossible. I think in the end this saved me as I would have been tempted to go for it here normally, but instead I just sat behind a small group of guys and recovered from that first push. I knew as well from the recce that as this flat section ended, it opened out on the next uphill section, but that section was short until the first aid station. When we reached it, I put on a push knowing there really wasn’t far to go before the top and this allowed me to pass about another 10 people. The first aid station was at Sunnegga. I knew that from here there was a long, wide downhill track followed by a small climb and some traversal of a hill before the subsequent station at Riffelalp. I decided for this race to wear my Salomon vest simply to enable me to carry more fluids as I knew it was going to be a hot day. This worked great as I had two 500ml soft flasks filled with Tailwind. I’d drained one flask on the first climb and I knew I wouldn’t need more than one more flask to the next station, so I decided to simply grab a glass of water and keep running. This fast pit stop and the subsequent attack on the downhill earned me a significant number of places. I was surprised throughout the race at how few people were letting go on the down hills, especially as many of them were on wide, smooth tracks. On the way to Riffelalp we passed markers where the 46km race broke off the route to take in a loop up to Gornergrat. I was reticent of not signing up to this longer distance race leading up to the start. 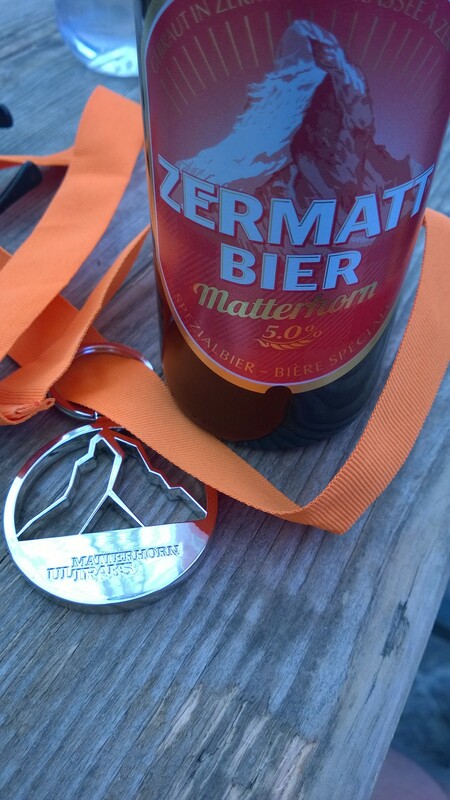 In hindsight I think I probably enjoyed the 30km better, but I would like to go back and take on the bigger distance. We got to Riffelalp far faster than I anticipated and I had barely drained my remaining soft flask, so I decided on another short pit stop, grabbing two glasses of water and a handful of dried fruit. The aid stations were perfect in my opinion, they had a bounty of stock considering both the 46 and 30km races had been passing through and it was broadly laid out so people weren’t climbing over each other to get to it. As we neared this stop the sound of alpine horns started to drift through the air, it really added a wonderful atmosphere to the race. Next up was Furi, which was another short descent away from Riffelalp. The trail on the way become a little technical and slowed things down considerably. It was obvious people were starting to tire as there were plenty of trips and falls as folk clipped their toe on a rock or a tree root here and there. Before we could get to the water stop at Furi, there was a small matter of a suspension bridge to cross. I’d recce’d this before hand so knew what it was going to be like. I’m glad, because I think if I’d stumbled into this mid-race I might have been a bit spooked! 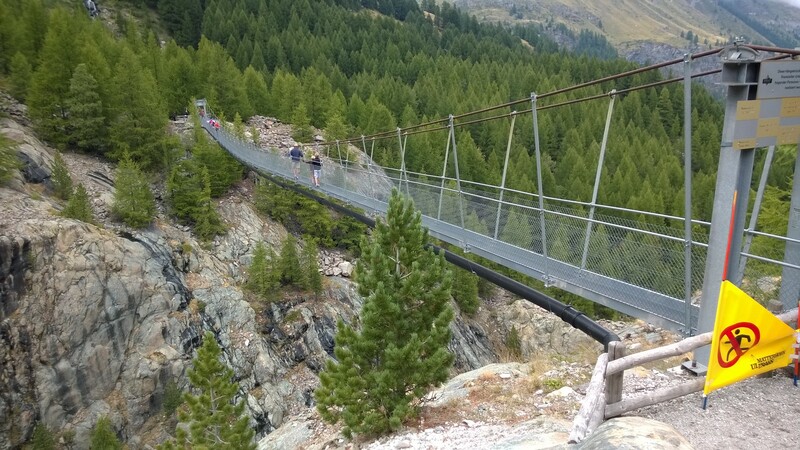 Furi suspension bridge – and yes, it does move! The course team had flagged it to stop people from running on the bridge. This kind of worked, but as I crossed it, there were about 10 runners all speed walking across it. The bridge was considerably flexible and this amount of traffic on it had an interesting effect! At Furi my partner, the wonderful and beautiful Nichola, was there to meet me and give me encouragement. I was ready for the pit stop here and had my sachet of tailwind ready to drop into one of my soft flasks for the final climb up to Schwarzsee. I almost ran straight into Nichola as I was sorting this stuff out! It was great to see her and it really gave me a lift for the next section of the course which was certainly the hardest. This was about the only bit of the course I wasn’t looking forward to. From Furi it is an almost vertical climb up switchbacks to the next station, Schwarzsee. It was hard going, but just a case of keeping your head up and pushing on. I’d seen the trail from the chair lift and knew it was steep, but it was made even tougher as the sun was out by this point and the temperature was creeping up towards 30 degrees. After about 30 minutes, the summit came in sight and one final drive of the legs got me through the timing gate at the top. I was 3h 05min into the race and I had run the remainder on my final recce, so knew what lay ahead. 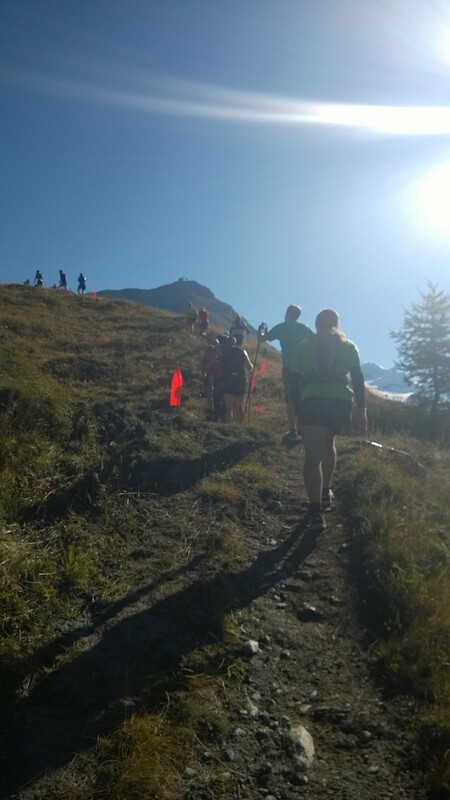 It was mostly downhill on single track trail with just a short uphill section as the trail turned back towards Zermatt. 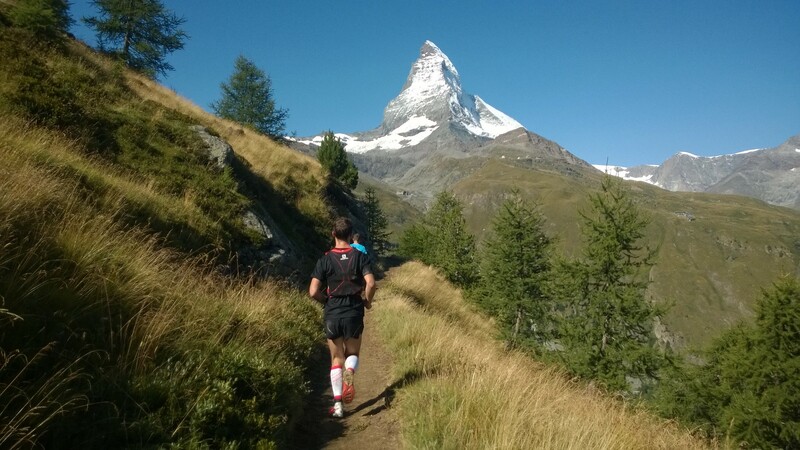 This is possibly the most scenic part of the course, with a backdrop of the Matterhorn all the way. Before the race, I was thinking I would be close to 5 hours to finish, as I hit Schwarzsee I wasn’t really paying attention and also, Nichola had said she was heading up to meet me too. I spent about 5 minutes at the aid station here looking for Nichola, who it turns out was there but I just didn’t spot her. I eventually gave up and started the descent thinking I was probably at about the halfway mark in the field and had not much to run for. As I headed down I recognised that I was just over the 3h mark, and figured that as long as I take it steady I should make sub 4h 30m, so I set off. My stomach started to ache as I headed down, I think I took on too much water at the aid station so everything was bouncing about a little. This slowed me down, but eventually wore off enabling me to open my legs a bit as I headed into Zermatt. I had one guy in front of me who I could see but at some point the 16km race joined the trail and I was confused about why so many people were in front of me! Eventually I spotted the guy ahead of me but he was too far for me to catch. The race folds around town to enable a finish up the main street with everyone cheering from the cafes and bars. It again created a wonderful atmosphere and the race planning was perfect as all of the main adult races were finishing about the same time. I crossed the line in 4h 12m and was delighted with how my race had gone. The winners from the 46km race were still being interviewed as I crossed so I assume they had only just finished too, and it felt amazing to be amongst such great runners. After the finish line you were presented with what I think is both the best race medal I’ve ever had and also the best race t-shirt I’ve ever had. There was also a further aid station immediately in the finishers area and lots of area of shade to recover in. 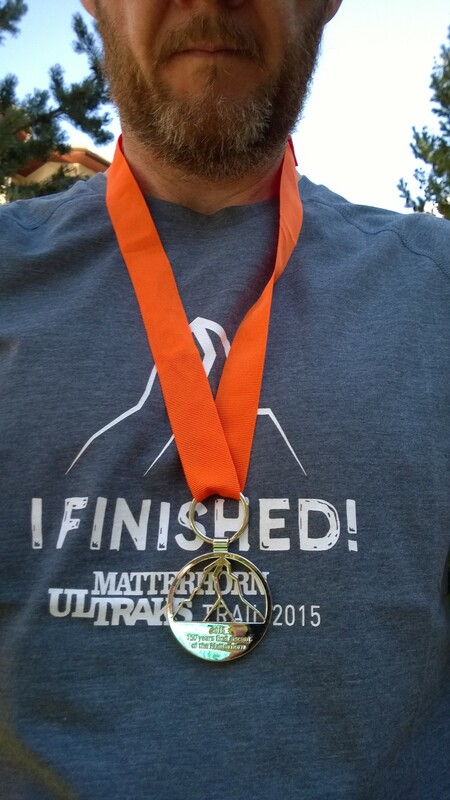 The sun was out, I had my finishers medal and new t-shirt out and it felt amazing. As I sat in the shade I looked across and saw Tom Owens who runs for Salomon taking a breather next to me. He had come 6th in the 46km race which is an incredible performance. I’d seen Tom run in Carnethy 5 and Birnham Hill race earlier this year and recognised him and said hello. Those guys are incredible athletes and it turned out he was a really nice guy too. I ended up finishing 78th overall and 18th in the V40 category, which in both cases I am delighted with. To finish in the top 20% or so of a race of this distance with so many runners is really encouraging and made me feel great. Looking back and analysing my race, the slow start helped me as did knowing the course from my recces. I knew where I could push hard and knew where to recover and this paid dividends. I remember from Riffelalp passing people who had started stronger but were slowing down, and recognised that had been me in other races. It felt great to feel like I’d paced it better and had a steady performance. I also felt strong on the climbs, felt like my hydration and nutrition worked well again (Thank you Tailwind!) and all my kit worked well. I wore a Salomon vest, Salomon s-lab exo t-shirt, inov-8 shorts, Salomon s-lab sense ultra shoes, it just all worked perfectly. The race was exceptionally well organised. During my recce’s I had spotted the guys a few times out and about around the course during the week before putting out markings. There was hundreds of small orange marker flags all over the mountains making it exceptionally clear about where to go. There were also large signs at any major junction to make it clear about which direction to go. This was how all races should be marked over big areas like this. The aid stations were perfectly managed, the pre and post race facilities were exceptional, a great hot meal was available for everyone. It was just all excellent. A huge congratulations and thank you to the race organisers, volunteers and people of Zermatt for putting on such an excellent event. I felt great the next day and wanted to head out for a recover run. I was intrigued by the section from the 46km race that I hadn’t seen. This was a tough climb up to Gornergrat which I’d seen when I was up there sightseeing earlier in the week. I studied the map on Sunday morning and decided to get the train up to Sunnegga and follow my instincts. 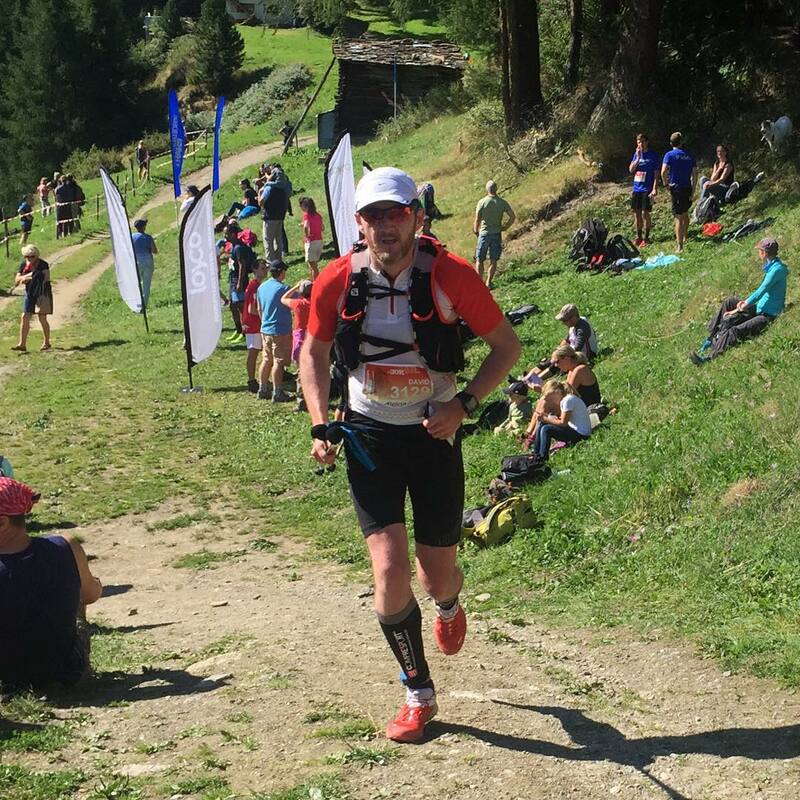 I cut off a little of the descent towards Riffelalp and contoured the hill before joining the race route from the 46km race a little further up the hill. The climb was really tough and technical in places. There were plenty of craggy sections and very little in the way of sections where you could recover. I was taking it easy to respect what my legs had done the day before, but it was still a really enjoyable run. 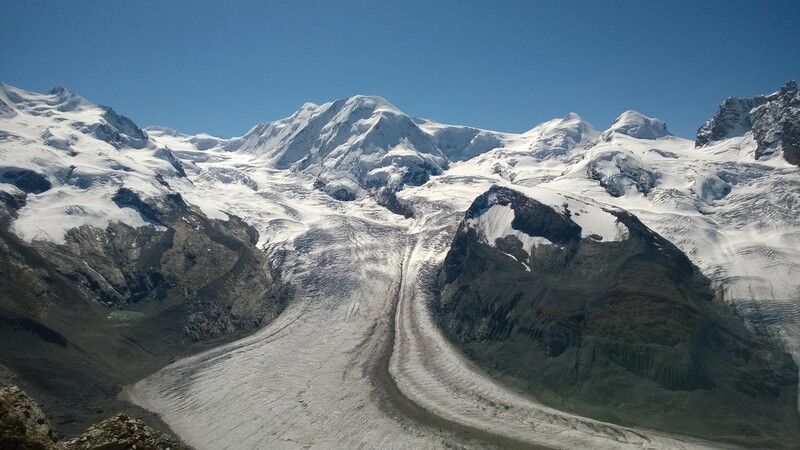 I got up to Gornergrat in just over an hour and was rewarded all the way with spectacular views. The Strava activity for this run is here. Now I know what almost all the 46km race route is, I would love to head back next year and take it on. Leaving Zermatt after such an amazing week was really difficult. Whilst we have spectacular hills and scenery in Scotland, the alps are at another level entirely and really pull on your heart stings if you love being outdoors in this type of environment. The trails and mountains were perfect for running and I can’t wait to go back. The Strava activity for the race. Next up for me is the Ben Nevis Race. This is a huge race in the UK hill running calendar and looks to be such a tough race. I’m nervously looking forward to it as it’s my first time, but with under two weeks to go, there is little I can do in the way of training which will help me. I’m planning on a few easy runs in the hills over the next week before taking a few days off before I reach Fort William and the start. Watch out for an update near the time. Those Mountain races must be a blast. Wish I could get over to do some running in the Alps. Keep at it. They are amazing Kevin. If you ever get the chance to visit, jump at it!